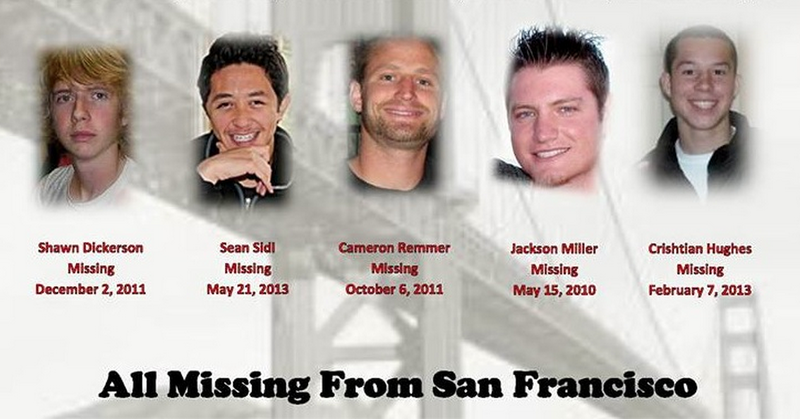 Five families, whose sons have been reported missing, including one who lived in the Mission District, want city officials to consider making May 21 a day to remember missing persons in San Francisco. On Saturday, the relatives gathered for a vigil at Golden Gate Park’s Music Concourse to bring renewed attention to their children’s cases. “We can’t find them unless people know they’re missing,” Lynn Ching, mother of Sean Sidi, who disappeared on May 21, said to the audience of 200. The parents of the “California Five,” as the missing men are called, spoke to the crowd between sets of blues. The vigil was designed to draw in passersby to increase awareness. Shawn Dickerson, 24, disappeared Dec. 2, 2011. He lived in the Mission and has not been seen since he left for work that morning. Jackson Miller, now 23, of Cupertino, disappeared May 15, 2010. Miller left his car, identification and wallet at the Golden Gate Bridge parking lot. There have been sightings of Jackson in San Francisco, according to his parents. Before he went missing, his parents said Miller had been transitioning from one type of anti-anxiety medication to another. Cameron Remmer, now 31, of Carlsbad, Calif., disappeared Oct. 6, 2011 while visiting San Francisco. He was reported found by the San Francisco Police Department on Halloween of that year but it was a case of mistaken identity. There have not been any sightings of Remmer since, according to the parents. Crishtian Hughes, 20, went missing Feb. 7, 2013 while visiting a friend in San Francisco’s Ingleside neighborhood. Sean Sidi, 19, of the Bernal Heights neighborhood, went missing May 21, 2013. Sidi had suffered a traumatic brain injury earlier this year. His parents said he’s at serious risk. If found, the authorities will know to provide him urgent medical care. The day after Sean Sidi didn’t come home, Lynn Ching, a lawyer, called her friend Elizabeth Prehn, a law student, for help. Prehn, 36, has been involved in many ways, particularly working with the John Burton Foundation for Children Without Homes, a San Francisco-based organization that advocates for California’s foster, former foster and homeless youth, to create a resolution to put before the Board of Supervisors. “The resolution will make May 21 a day to remember the missing in order to raise awareness of their plight, the impact these missing have on the lives of San Francisco residents, their families and history,” Prehn said. Prehn has been working with District 9 Supervisor David Campos’ office to bring the resolution forward and requested that the public ask their supervisors to support it. According to the National Crime Information Center, at the end of August, there were 1,376 active missing person cases in San Francisco and 20,098 active missing person cases in California. There has been much frustration for the families. Trisha Brucker, Dickerson’s mother, said San Francisco police treated her son’s case like a missing wallet. The police wouldn’t trace Dickerson’s phone, nor check for use of his social security number, according to Brucker. “We must treat all our adults, male or female, like they’re more than a wallet,” she said. Alexander Mullaney is a journalist and publisher in San Francisco. In 2008, he founded The Ingleside Light, a monthly neighborhood newspaper with a circulation of 10,000. In The Ingleside Light he reports on community affairs and publishes the work of both local and student journalists and photographers. He sits on the board of directors of the Geneva Car Barn and Powerhouse, the Ocean Avenue Association, and the San Francisco Neighborhood Newspaper Association. In the summer of 2013, Mullaney organized and managed two community journalism courses for youth with City College of San Francisco and the non-profit Geneva Car Barn and Powerhouse. The pilot program paid students stipends, offered both high school and college credit, and published their articles and photographs in The Ingleside Light. He intends to find funding to offer the program in 2014. Mullaney holds a bachelors degree in creative writing from San Francisco State University. He is studying multimedia and longform writing at UC Berkeley's Graduate School of Journalism. He plans to use his time at graduate school to expand his reportage to produce stories for the public good. And who is going to fund the cost of added police to attempt to track cell phone use, social security number use, etc? The SFPD is currently over worked as it is… and as stated these “missing” are all over the age of consent. Maybe, just maybe they don’t want their families to “find” them!